We have created a series of incentives for lenders on our live auctions, which are applied after a successful auction. Each incentive is exclusive of others, so you can only qualify for 0.5% on any one loan. Each incentive has a symbol that appears next to your bids, so you know whether you’re eligible for an incentive payment. 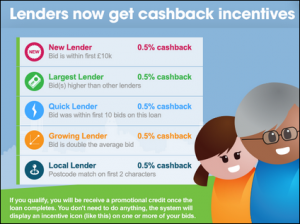 If you’re a quick lender, try to lend at a rate you think will be accepted at the end of the auction, because if you’re outbid you’ll lose the incentive! Credit through incentives will be added to qualifying users balances. rebuildingsociety.com reserves the right to amend or withdraw these promotions at any time.